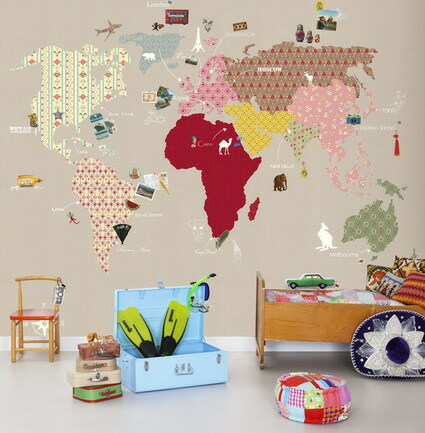 I have seen images of this quilt-inspired, vintage-looking world map wallpaper around a few places (Pinterest if I'm honest), but I can't find the source for it. I can tell it's wallpaper from the seams I can see, but I have no idea who made it or when they did. 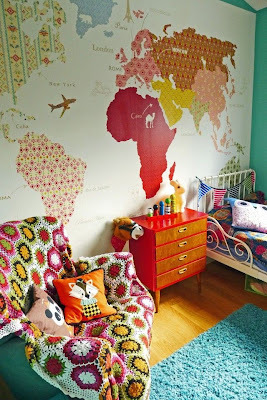 The set up photos look more like modern nurseries than mid-century nurseries, so I think it's vintage-looking wallpaper and not authentically old, but you'd think something this pretty would still be for sale if it was new. If you can find it, this vintage-looking world map wallpaper would be a great addition to any travel-themed nursery. I love this wallpaper, too! It is sold at http://www.mrperswall.com/node/63024.